Poste Italiane has defined the technical characteristics of equipments through an international invitation to tender for the supply of n. 30.000 readers scanner of post bulletins and checks won by enterprise network OLIVETTI-TELECOM, in collaboration with SEAC Banche Spa which has provided its technology, know how and great experience in design and production of scanner. Poste Italiane is the largest service infrastructure in Italy with about 14.000 office and over 53.000 branches all over Italy, 143.000 employees and over 40 million customers, for postal logistics, investment, payment, insurance and digital communication services. The attention to innovation and investment in technological research allowed Poste Italiane to achieve excellence in finance, quality and efficiencies of services. Poste Italiane, since some years has started a dematerialization program, in order to manage post bulletins. The scanner chosen by Poste Italiane, in SEAC Banche product portfolio, is ORION model that have demonstrated high-quality performance and reliability for use, overcoming the different steps of quality control. Orion reader scanner is indeed a response to the needs of advanced optimization and simplification of the processing of documents of different formats, from A6 to post bulletin and booklet post. Technical and innovative solutions of model ORION meet the needs introduced by the image processing of checks and documents and ensure provide functionality and performance at the highest level. Orion incorporates an inkjet printer which prints on documents processed both text and graphics till ½ inch to meet customers needs. Ergonomic and easy to use, Orion reader provides an high quality image thanks to its last generation scanner at 300 DPI, combined with the benefits of very high performance flexibility. Its automatic document feeder allows end users ease of use. This important supply consolidates SEAC Banks confirming its market position and the unquestioned ability of its research and development division. 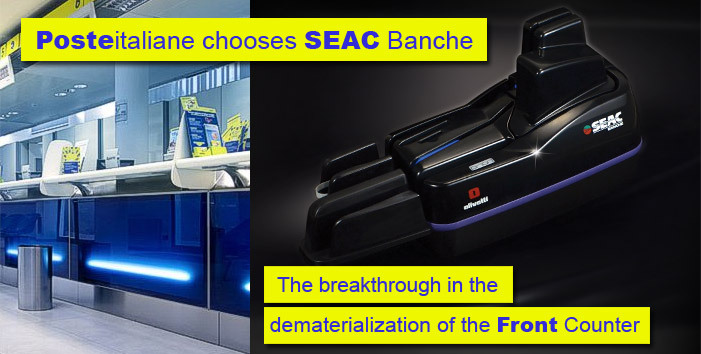 The technology of SEAC Banche scanner full fits new and recent provisions of the ABI (Italian Banking Association) about safety of checks trough micro holes detection and this will help to make Seac Banche offer more competitive in all italian markets. The President Giovanni Lamberti and the Chief Executive OfficerEugenio Bubba express great satisfaction with these important goals achieved, which will allow to SEAC Banche to position themselves very well in italian and international markets. Giovanni Lamberti and Eugenio Bubba, respectively President and CEO of SEAC Banche, have signed the important contract, in pooling with Olivetti-Telecom, for the supply till to 30.000 ORION readers scanner to Poste Italiane.